Never been an artist before? Take a deep breath and recolor the most beautiful Japanese wood block prints with your own favorite colors! Dive into old Japanese world and enjoy the artistic freedom like never before. Free your inner creativity. Woodblock printing in Japan is a technique best known for its use in the ukiyo-e artistic genre of single sheets, but it was also used for printing books during the Edo period (1603-1868). The Great Wave off Kanagawa by the artist Hokusai is the most well-known example, and on of the most well-known works of Japanese art. – Recolor Japanese wood block prints with beautiful kimonos and samurais with decorative swords. 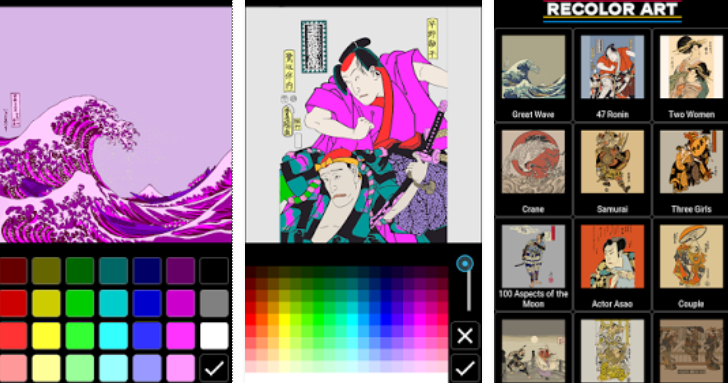 – Recolor the most beautiful artworks with new color combinations. – Share your recolored pictures with your friends or the whole world, through social media or e-mail. – Tap to paint and pinch to zoom. – Works offline, no wifi needed.